At BEC Integrated Solutions we offer an IP Network Based video intercom system specifically designed for single tenant units. Our IP-based Video Intercom System includes outdoor camera stations that communicate with the paired indoor touchscreen monitor(s). Our products will give you superior security for your commercial business, office complex, apartment or even your own home residence. 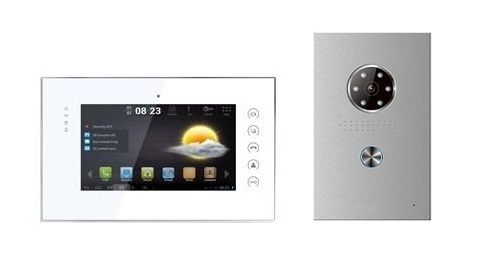 Consider our IP Network Video Intercom System for your single entry home or office building. Providing an IP Network Based Video Intercom System for your family and single tenant apartment building or office building delivers both security and accessibility to its users. Our NT-IPG9 Video Monitor features a high resolution touch screen for your entryway video monitoring. This video intercom system comes with outdoor station and management center as well as 8 alarm stations. The NT-IPG9 Video Monitor features image memory technology to allow you to see who is going and coming from your facility and review those photographs if needed. The system also comes with an SD card, calendar, time and date and clock for display. Easily control the locking and unlocking mechanism remotely or by password unlock. This NT-IPG9 Video Monitor system is second to none and offers the security you need for your business or apartment complex. The NT-IPA3K Door Panel provides a reliable solution in video intercom technology. This video outdoor station features a bright LED/LCD display with a 420TVL resolution. The infrared technology gives you the ability to monitor each entryway during the day or night. The intercom door panel is equipped with advanced audio bi-directional intercom with indoor monitoring and management center. Unlock the NT-IPA3K Door Panel by password or IC/ID card (optional). Our NT-IPA3K Door Panel comes with a rugged aluminum-alloy surface to protect it from the elements and from everyday use. Get the best in door panel technology by purchasing the NT-IPA3K Door Panel that we offer. With a high resolution CCD camera and only DC 12V power requirements, the NT-IP-DRS1 (white) or NT-IP-DRG (black) Door Panel is a must for your single entry video intercom system. This intercom system comes with an indoor monitoring and management center while supporting SIP protocol to communicate with IP phone. The Zinc alloy polish casing protects our rugged door panels from the elements ensuring that they are waterproof to provide protection in all the weather elements and daily use. The NT-IP-DR model door panel comes in black or silver color options based upon your need.